Support online orders and online orders being showed in the POS instantly. Able to send orders to printers in multiple locations (kitchen, bar, bakery) and, support any brands of receipt printers . Intuitive user interface, easy to use and understand without training. 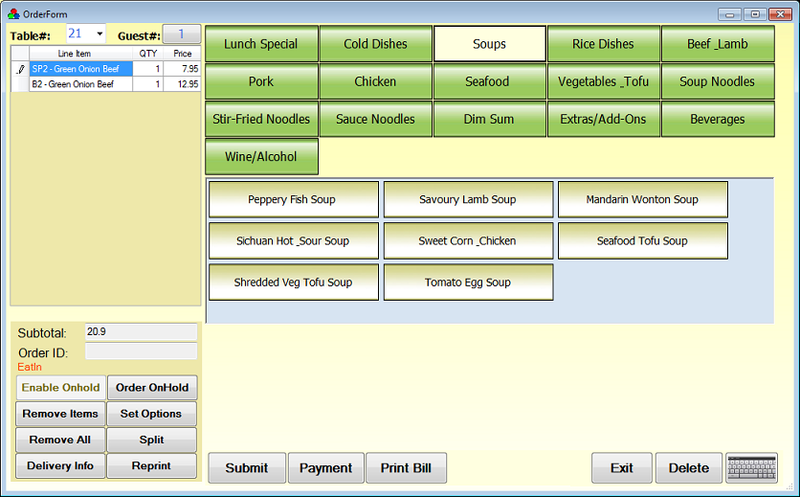 Include Dine in, Takeout, and Delivery functions in separated interfaces. Network based design, support multiple users and computers. Table status will be refreshed automatically and instantly. Bilingual support and it is good for restaurants required two languages being displayed in parallel. Customizable report and receipt printing, and support PDF format export. Offer report filters for easily getting category or specific menu based sale reports; managers are able to know which the best-selling is for the day, week, quarter or year. Easy split bills for share table, or merge tables for one bill. Roles based user management; user with low permissions cannot see or change sensitive data. Able to integrate with your online orders, and for multiple restaurant locations, data can be replicated to a center location so that management can see each location’s order status instantly and remotely. Simple design for owner to maintain categories, menus, tax rates, and sales. Separated button to open cash drawer. Large button design for better support touch screen. Easy to set up item combo, and item options.